I made this cake for my aunt who is a prophetess. 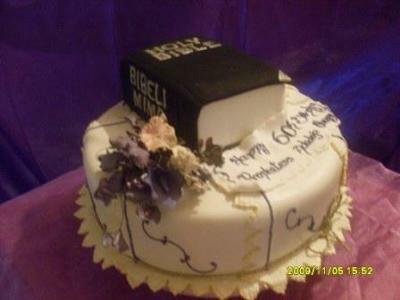 It is a round cake with a rectangular shape for the bible. I covered the bottom cake with fondant and I cut the side edges with with a lace cutter and embosser. I later painted the edges of the lace with gold dust. I covered the bible with black fondant and painted it with black dust color.